Oakland, CA, 2018-Nov-06 — /Travel PR News/ — Lineage Logistics, LLC (“Lineage”) and Dreisbach Enterprises (“Dreisbach”) announced the official opening of Lineage Cool Port Oakland (“Cool Port”), the world’s latest next-generation cold storage and logistics facility. Set on 25 acres at the Port of Oakland’s waterfront, Cool Port will serve as the newest hub for temperature-controlled cargo transitioning through Northern California. Cool Port is a collaboration between warehousing and logistics industry leaders Lineage and Dreisbach, with additional funding and support from the Port of Oakland and the State of California. This combination brings together world-class cold-chain logistics expertise and steadfast commitment to innovation and community growth. Cool Port sets a new standard in efficiency, food safety and speed in the temperature-controlled and transportation industry. 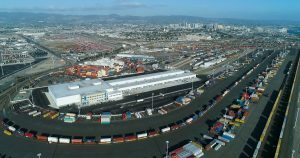 The 280,000-square-foot depot with 90 truck dock doors can send up to 1,000,000 tons of perishable product through the Port of Oakland annually. Cool Port’s strategic proximity to the Port’s marine terminal entrance will expedite the transition process between ship and warehouse, thereby reducing transportation costs and energy expenditure. Oakland is the last port of call for transpacific cargo – ensuring faster transit times for shipping perishable food products to Asian markets. A secure, fully cold-chain compliant facility, Cool Port offers 20,000 pallet positions, has three blast cells and includes a 100,000-square-foot, high-cube, multi-temperature storage environment. The new facility also supports a full range of services including rail transload and truck cross-dock operations, frozen and refrigerated storage, import-export services, onsite U.S. Department of Agriculture inspection and labeling capabilities. Cool Port will significantly reduce truck usage compared to standard temperature-controlled facilities, resulting in reduced diesel emissions. Up to 36 railcars per day can go straight to shipping containers to be loaded eliminating the burdensome need to load cargo onto trucks for transfer between ships and rail. Cargo-handling equipment for Lineage Cool Port is also 100 percent electric-powered, which is projected to prevent nearly 9,000 pounds of CO2 emissions in the first five years of operation. Cool Port will also use lightweight chassis and tractors to increase pounds per container, decreasing shipping costs and lowering transaction complexity. The Port of Oakland serves the Bay Area, one of the most vibrant and fast-growing regional economies in the world. The new operation will also drive job growth in the region, employing roughly 200 people from Oakland and other nearby locations. Oakland, already a hub for ocean transport of chilled and frozen meat products, will see eight new jobs created each time 1,000 new containers are moved through the facility. The Port of Oakland has committed to a five-year strategic plan that ensures that the local Oakland community benefits as the Port progresses in its development. The Port of Oakland currently provides employment for 73,000 workers, and this number is expected to continue to grow. Dreisbach Enterprises, Inc. provides refrigerated warehousing and logistics services in Northern California. Its warehousing services include conventional public cold storage, order pick distribution, import/export, drayage, blast freezing, IQF processing, cross-docking and trans-loading, and local and interstate trucking; specialized loading and unloading of air freight containers; and specialized handling of temperature sensitive fresh fruits and vegetables. The company’s logistics services comprise drayage and shuttle services, including drayage/legal overweight container hauling, point of manufacturing shuttle, and localized order delivery fulfillment; and third-party logistics services. The company was founded in 1953 and is based in Oakland, California. For additional information, please visit www.dreisbach.com. This entry was posted in Airports, Business, Travel, Travel Services, Travelers and tagged Chris Lytle, cold storage, Cool Port, Dreisbach, Greg Lehmkuhl, Jason Dreisbach, Lineage, logistics, Oakland, Port of Oakland. Bookmark the permalink.